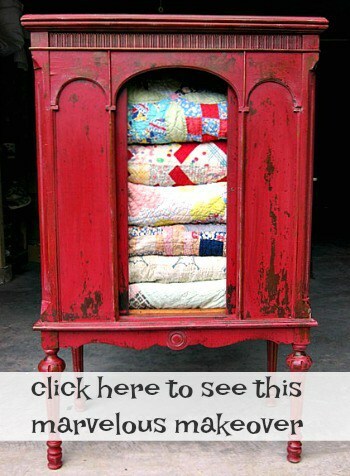 I took you on a tour of the April Nashville Flea Market but I didn’t’ show you all of my flea market furniture finds. It was a good month for furniture! Some months I don’t buy a single piece. All three of my finds this month came from the same vendor, one of my favorites, Rodney from Indiana. There are two Rodney’s from Indiana that come to the market each month and I learned they are known as Rodney number 1 and Rodney number 2. I got my furniture from Rodney number 1. I like to get some idea of the age of furniture I buy or at least know what it is. This cabinet has me stumped. 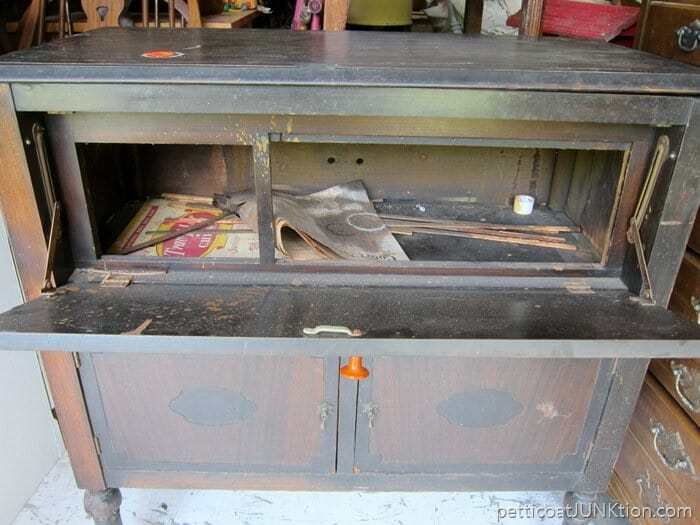 I think it was a radio cabinet or stereo cabinet but not sure. It’s too new for the big clunky radios but too old for stereos….I think. Obviously there was some kind of electronics inside but I don’ t know what. The old newspapers inside are from 1998 so they are no help. 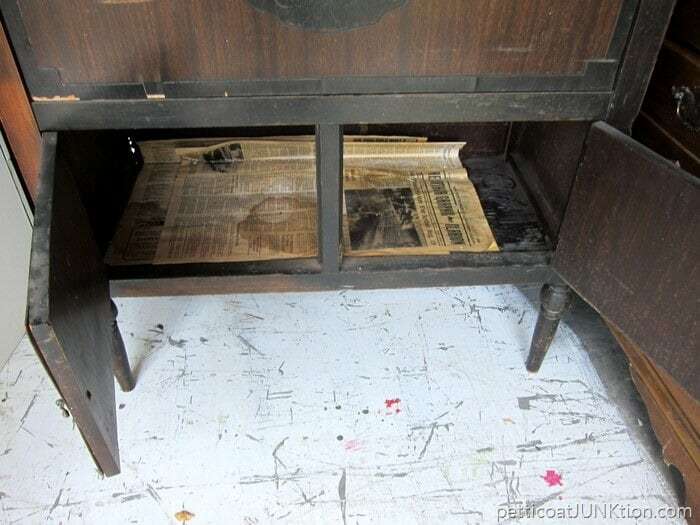 The newspaper is the Arthur Graphic Clarion, an Amish newspaper from the Village of Arthur, Illinois. Can anyone help me out. I can always count on you guys. Do you remember the piece I thought was from Germany? 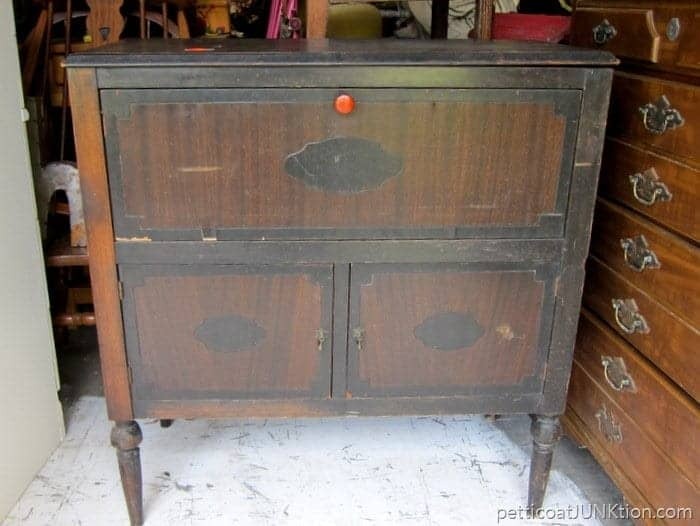 The really beat up chest of drawers? One of you contacted a friend in Germany and sure enough the chest is German made. I love you all. 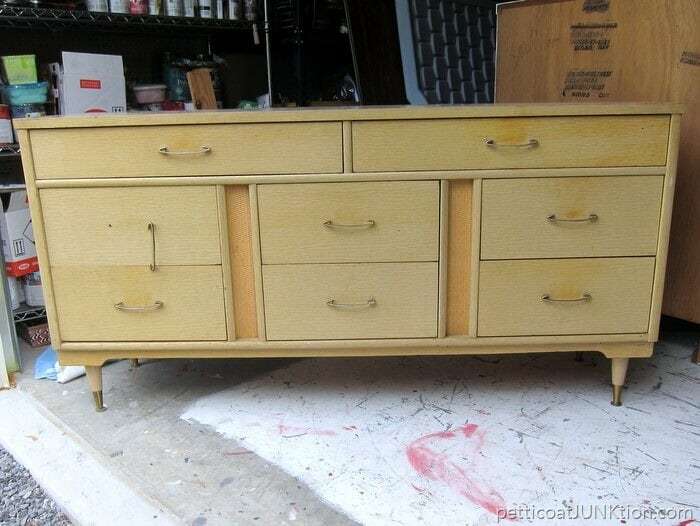 The mid-century modern dresser is spoken for. My sister in Arkansas is having a new house built and she has the perfect spot picked out for it. I think the color is going to be a shade of green. I’m in charge of the makeover. 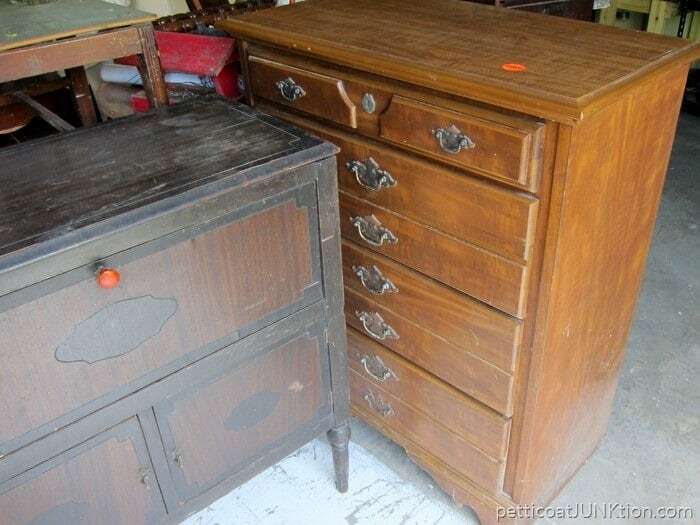 The small chest of drawers is in good condition. Yea! That doesn’t happen very often. I also bought these pieces. I thought they were furniture knobs but a reader says they are curtain tiebacks/holders. I think she’s right. I can’t seem to find anything on the internet anymore. Maybe “Googling it” isn’t all it’s cracked up to be. I plan to use them as furniture knobs, just have to find the right piece. I plan to spray paint the “knobs”. I’m not in love with the original color. 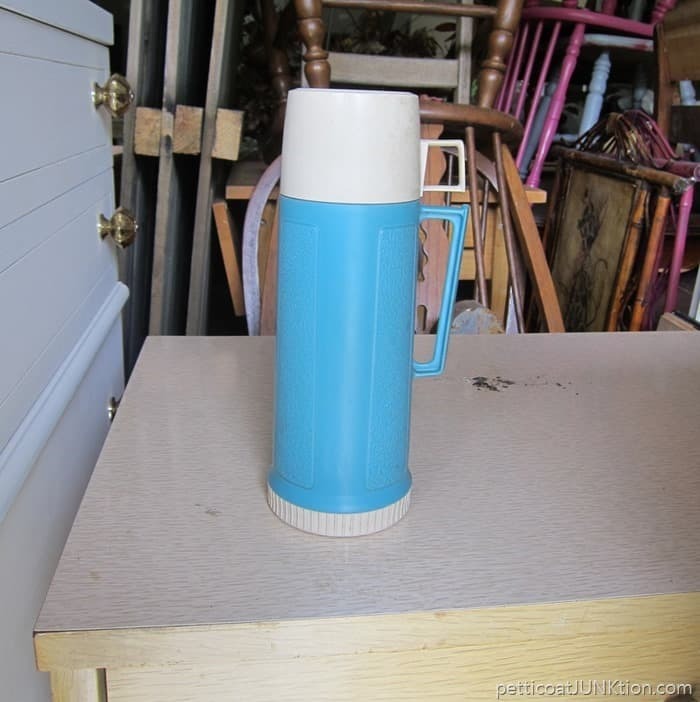 Any ideas for the vintage thermos…..besides using it as a flower vase? I’ve got nothing. All I can think is flower vase. 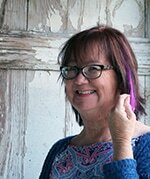 I do love the turquoise color and for $3 I needed it. I didn’t get that piece of furniture finished yesterday but I do think it’s going to come together. I had my doubts. Hopefully I will finish it today and you guys will get to see it tomorrow. Have a great day. 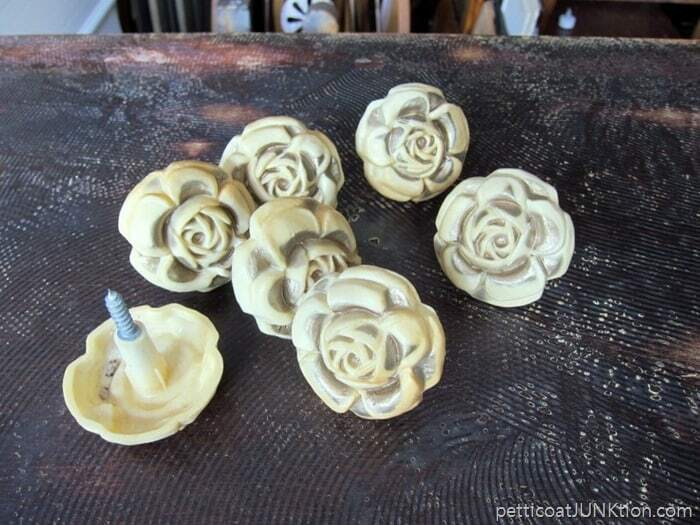 I think that the rose Knobs could be made for just that purpose. I definitely think a new color would be better. And you should Google it, not goggling! LOL Got a laugh out of your error in spelling. hahaha. I’m going to blame it on auto correct 🙂 I just corrected it. Thanks Rose! This is my first time to your site here, I was wondering do you have some of the furniture you may of done in your past. Just wondering. I would love to see some. Thanks for your sight! Not sure what it is yet, but I like it. I love the first piece. I can’t wait to see what you with. I think I know Rodney – at least one of them, being from Indiana! Great Stuff! put your cooking utensils in it on the stove! Make the thermos into a birdfeeder? I haven’t tried it yet, but it could be interesting. The thermos can be turned into a lamp. I’ve seen pictures on Pinterest where people have done that and it looks awesome. I love that dresser! If your sister doesn’t get it I’m coming for it! And those tiebacks are really cool. They’d be neat to attach to a wall and hang bags and scarves from. Maybe I need those too! Lol!